The alternative rockers from New Jersey - led by frontman Gerard Way - announced their split in a joint statement on the band's official website. "Being in this band for the past 12 years has been a true blessing. We've gotten to go places we never knew we would. We've been able to see and experience things we never imagined possible. We've shared the stage with people we admire, people we look up to, and best of all, our friends," they wrote. "And now, like all great things, it has come time for it to end. Thanks for all of your support, and for being part of the adventure," they added, signing off as My Chemical Romance. 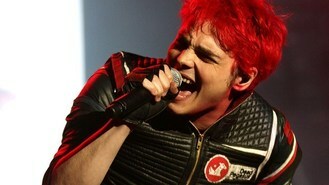 In an extended tweet, Gerard thanked the fans, and denied that the group chose to disband due to arguments. "I can assure you there was no divorce, argument, failure, accident, villain, or knife in the back that caused this, again this was no one's fault, and it had been quietly in the works, whether we knew it or not, long before any sensationalism, scandal, or rumour," he wrote. The 35-year-old lead singer added: "My Chemical Romance is done. But it can never die." The quintet, who got together in 2001 before drummer Bob Bryar left in 2010, had hits with singles Welcome To The Black Parade in 2006, and Famous Last Words and Teenagers in 2007.